Happy day! How did your week go? We were plagued with another snow day. I say "plagued" with a little sarcasm because I really do love and appreciate them no matter how far behind they have made us this year. Knowing my luck, we won't use a single snow day next year. I always love this time of the school year. The students are really blossoming, everything is beginning to click into place, and we can really start to dig in deep to our standards and learning experiences. One of the highlights from my week was introducing a new reading strategy tool to my kiddos. We have been breaking down text for a while now. They have highlighted, flagged, underlined, circled, and labeled their little hearts out to help us be better readers. We have spent so much time on this during the school year that it has become second nature to most of my students and seeing them take their time to read and comprehend makes my heart so full. In fact, one day last week, I was getting so confident that my students were moving mountains with their close reading skills that I encouraged them to not use any of our marking strategies. I told them not to highlight, label, or mark up the text in any way. I wanted them to be close readers but to do it without physically breaking down the text. I was SURE that this would not be a problem. Unfortunately, they panicked and I realized just how much more work we still had to do. Many of my students went from being able to read a passage and answer most, if not all, of the comprehension questions correctly to missing most of them. They didn't take their time reading. They didn't go back and look for evidence in the text. It was heartbreaking, and I felt like we had just taken five steps back instead of moving forward. Honestly, it was a blessing in disguise for many reasons. After reflecting on why they were so flustered by taking away their text dissecting tools, I came to the following conclusions about my readers and our approach to close reading. 1) Yes, marking text can be a great tool and a strong step in the right direction to helping students read AND comprehend the text. 2) Some students spend so much time marking answers that they are still missing the point of "close" reading. 3) If you take away these physical tools then the students stop applying the strategies mentally. 4) Students in my county are now testing online for some of our assessments which means that they can't just mark up the text as they read. We are not allowed to mark in our testing books either so my students cannot sorely rely on physical test taking strategies. 5) We have got to take close reading one step further. I decided that the best way to accomplish this was by creating a "checklist" for us to do mentally as we read. My students were already using Ashley's, from Schroeder Shenanigans in 2nd, close reading bookmark to help us be stronger readers. 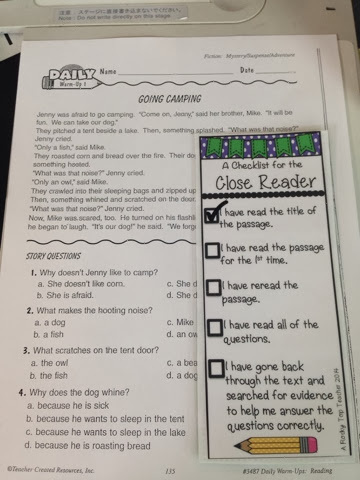 So, why not add a checklist to the back of our bookmark to help us remember the steps that we need to take mentally to help us be better, stronger close readers. I came up with 5 steps to include on the checklist. 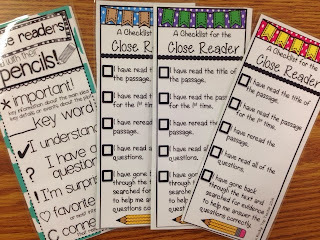 Day 1- Introduced the checklist to the students and gave them connections to how this checklist was going to make us stronger readers. Read a nonfiction passage in whole group. Students got to mark the text like we usually do while I modeled how to check off the mental strategies they would use with our new close reading checklist. Day 2- Students read a passage in small groups. This time, they didn't get to physically mark the text, but they did get to use the checklist to help them make sure they are reading for meaning and reading closely. Day 3- Students used the checklist to read a passage and answer the comprehension questions individually. We then discussed how this went in whole group. I had one student say that she would take her finger and point it to the comprehension question while using her other hand to skim through the text to find the answer. Yes! Please do that! Whatever it takes! Day 4- I took the checklists away from the students on the 4th day. I wanted to see what happened when I again took a tool away from them. I asked them to go over the steps with me. What do you do first? What do you to next? And so on....The class could tell me all five steps without using the checklist tool. So, I took this as a good sign that they were ready for this new challenge. They read a passage and answered questions on their own. I was impressed. They took their time, I could see them reading the passage more than once. They were paying attention to the questions and then searching back in the text for evidence. The best part was that they were doing it all without having to actually mark in the text. Success!!!!!!! 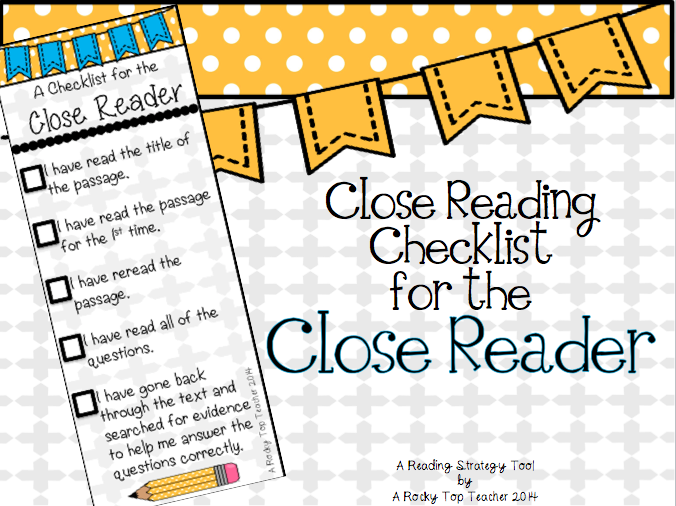 The close reading checklist can be found in my TPT store here! Check them out and let me know how you are using them in your classroom! Are we ready? Not quite yet. We still have a lot of room to grow. The passages that we used this new strategy on were short, and not as deep as the ones that we will be tested on. But, they will get there and we CAN do this. Our goal for the next few weeks will be reviewing our main reading skills and making sure that we can apply those skills to help us be "Master Close Readers". The whole process towards being close readers takes months and months. Students have to spend a lot of time marking up text and diving deep into the meaning of the text before they can be strong close readers. I think that this is something that we, as educators, have gotten away from in the last couple of years so I am glad to see Common Core is transitioning us back into. Shew..sorry for the long post. In other blogging news.....I have a new blog design going LIVE very soon, and my IG account is currently sitting at 997 followers. So...be looking for an AWESOME giveaway coming your way VERY soon. I promise you won't want to miss it. I can relate to what happened in your class. It happened to me last month. We definitely need to practice too. Love the bookmakers…what a great idea! Thanks. I love these checklist! 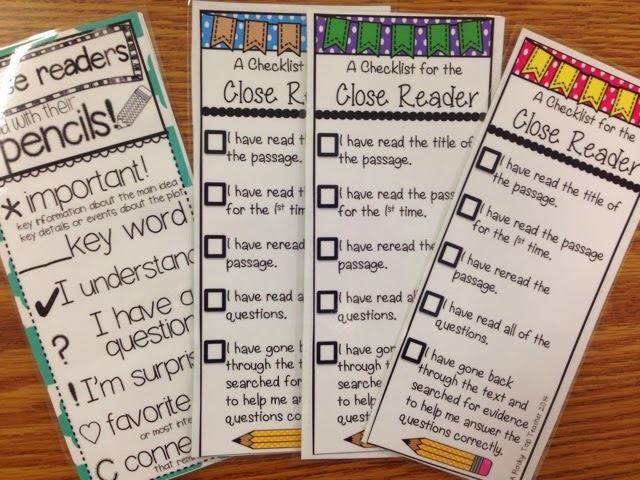 I'm just getting started with close reading and I'll definitely have to use these! I also absolutely ADORE your new blog design :) :) :) It is so lovely to look at!